If you're a user of any type of modern cell phone, then you must have heard of WhatsApp -- an excellent way to send text messages, videos and photos along with group chats. 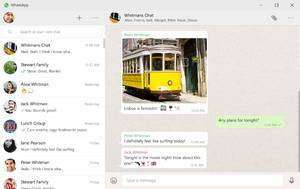 The official WhatsApp Desktop application is here and it allows you to access all of your chats the same way you would from your cell phone device. In order to use WhatsApp for PC, you're going to have to have an account and both your PC and cell phone should have a connection to the Internet. Synchronizing your PC and cell phone apps involves scanning an IR code -- that's it! Version 0.3.557 is a freeware program which does not have restrictions and it's free so it doesn't cost anything. For security reasons, you should also check out the WhatsApp download at LO4D.com which includes virus and malware tests. Additional screenshots of this application download may be available, too.